100 Rue Beauport – Downtown Natchitoches. Walking tours given by Cane River National Heritage Area available Tuesday - Saturday, call for tour times 318.352.8072. Time req: 45min - 1 hour. On your own Steel Magnolia filming sites, Northwestern State University and other historic sites. 800 Front Street – Developed and operated by the Louisiana State Museum system in partnership with the Louisiana Sports Writers Association and the City of Natchitoches, the 27,500-square-foot museum complex provides a permanent home for the Louisiana Sports Hall of Fame and its collection of portraits and memorabilia celebrating the achievements of more than 300 Louisiana athletes, coaches and other sports figures. The Northwest Louisiana History Museum explores the evolution of unique cultural traditions from early native-American civilizations to the present. The building itself, designed by Trahan Architects of New Orleans, evokes the region’s rivers and plowed fields with sinuous molded stone interiors and earth colored exterior sheathing.Admission. Group rates for 20+. Tim req: 90 min. 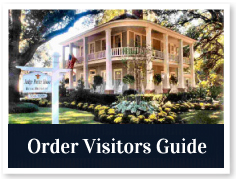 605 Second Street – Located in the Basilica of the the Immaculate Conception Gift Shop (318) 352-3422. Museum is the repository for early town records dating from 1724 and church artifacts, including a silver bell dated 1836. Time req: 30 min. 605 Second Street - (318) 352-3422. Built c. 1850s. Fittings and furnishings imported from France, original to building. Spiral staircase is significant in that it has no center support. Time req: 30 min. 758 Front Street – Step back into a 19th century general store and experience the charm of yesteryear. Open M-Sa 7-5. Closed major holidays. Time req: 45 min. Behind Prudhomme Building – 701 Front Street. The staircase dates to the 1850s. 310 Jefferson St. (318) 379-0055. 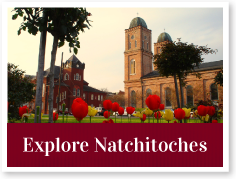 Natchitoches' first restoration. Listen to the story of the secret hiding place. View the lovely garden and fountain in back used as a filming site for the movie Steel Magnolias. Admission. Groups by appointment. Time req: 30 min.